The move comes after Disney’s Baby Einstein Co. last month announced “enhanced consumer satisfaction guarantees” after lawyers had threatened a class-action suit for false advertising. “The Walt Disney Company’s entire Baby Einstein marketing regime is based on express and implied claims that their videos are educational and beneficial for early childhood development,” a letter from the lawyers reportedly said. Come on parents: send those Baby Einstein videos back to Disney and give them a message loud and clear we won’t be fooled by slick marketing campaigns! « International Climate Action Day! 350!! First of all, I have never been fooled by any marketing campaigns. I received a Baby Einstein DVD when I first gave birth and I watched it myself before I let my daughter watch it. When she turned around six months old we watched the video together for the first time. After that I continued to use the Baby Einstein DVD’s and was impressed when by a year of age she could sign over 30 different words. She learned them from the DVD’s. She has a keen ear for Mozart, Bach and Beethoven and recognizes the songs. She knew her alphabet and numbers, both recognition and recitation, before she was two. I do not allow any mass marketed materials in my home and she no longer watches the DVD’s now that she is going on four. We do not have a television set so she watches only movies that we watch together on the computer. I still feel that the Baby Einstein DVD’s are wonderful and would recommend them to anyone. The key is to watch the videos WITH your child. It is never acceptable to plunk a child down in front of the television for hours. However, 26 minutes of an educational video watched with a parent cannot, in my opinion and experience, harm a child. These videos were an excellent educational tool and I will not be returning a single one for a refund. I completely agree with Kirsten. I too had a very similar experience. My daughter is now 5 and reads at a 4th grade level, was spelling words by age 3, and loves double digit math, fractions, and even multiplication. Do I think this is from watching Baby Einstein videos…..no, but I do think that it in no way inhibited her. 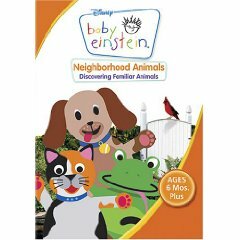 The Baby Einstein DVDs have been an excellent choice for us to use rather than watching shows on television (except maybe an occasional PBS show). I will not be returning any of our videos for a a refund either. I had some Baby Einstein videos way back before Disney bought them from the orginal creator. I think they were nice. The whole concept was based on studies that found children did better on tests and got better grades when exposed to classical music. Claims of increasing intelligence and making kids smarter…well that’s all subjective. That’s no differnt than saying going to school will make them smarter. Sure they are exposed to something that can help them learn but it does not mean they’ll actually “get smarter”. I must say though that exposing children to classical music is never a bad thing. I used to put my daughter down for naps playing classical lullabyes and she does better in school than my older son. Of course that could be because of many other factors as well but she is also much more into music and arts than he is. I will not be returning any videos either. My daughter is 17 months old, and has an astounding vocabulary, which includes 7 word sentences. I do not claim that Baby Einstein is the cause for her rapid development, but as the previous poster said-it doesn’t inhibit her growth either. As far as sales pitch and hype, I never put my faith into it either-whatever the product. I go by word of mouth and my own research. I have never heard anything too negative about Baby Einstein in particular, just tv watching in general. I believe in supervision and moderation. Actually, there was a study done maybe a year ago that found babies who watched the Baby Einstein videos actually had a *SMALLER* vocabulary as toddlers. The more time spent watching the videos, the fewer words the toddler said. That said, I do own a bunch of Baby Einstein videos and have found them very handy for the occasional “electronic babysitting”. My 3rd has watched much less than my older 2 simply because my oldest is now 7 and able to keep an eye on her younger siblings for short periods of time. I didn’t have that help when my other two were babies. With the news that Disney is offering refunds for their Baby Einstein videos, parents may be more willing to keep their babies and toddlers away from the set. If they need more motivation, I suggest reading the book, The Big Turnoff: Confessions of a TV-Addicted Mom Trying to Raise a TV-Free Kid (Algonquin 2007) by Ellen Currey-Wilson. It’s inspiring and hilarious (better than your favorite sit-com), and sure to make any parent think twice about using the electronic baby sitter. The author also wrote a great piece about Baby Einstein videos a couple of years ago when the controversy was just beginning. You can contact Ellen Currey-Wilson at ecurreywilson@gmail.com or visit her website. I wonder when it became so important at what age a child starts to read or how good they can count. To me it´s more important that my son gets a lot of time to play outside or with other children. I want my child to be allowed to be a child as long as possible without the pressure of being better than the others. That is going to start very soon anyway. But that´s just my opinion and I am sure every parent raises their children with best intentions depending their way of living. I’m not surprised by these findings. The methods in these videos go against everything that child and brain development researchers recommend for raising intelligence.